Restricted diets often mean no sauces on the foods you eat. Most sauces use a combination of the big three of death, salt, fat and sugar. So obviously they’re out. 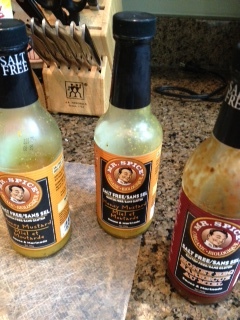 Dry, boring food can be the result, so I’ve been searching for salt-free marinades to use in my cooking. I’ve found two brands and like different varieties in each. The bad news is that neither of their salt-free teriyaki marinades/sauces does it for me, both compensate for the lack of salt with way too much pepper for my taste. I’m now using them sparingly on things like portobello mushrooms to finish the bottles. The good news is that other varieties are passing my taste test and becoming regular parts of my new restricted diet. 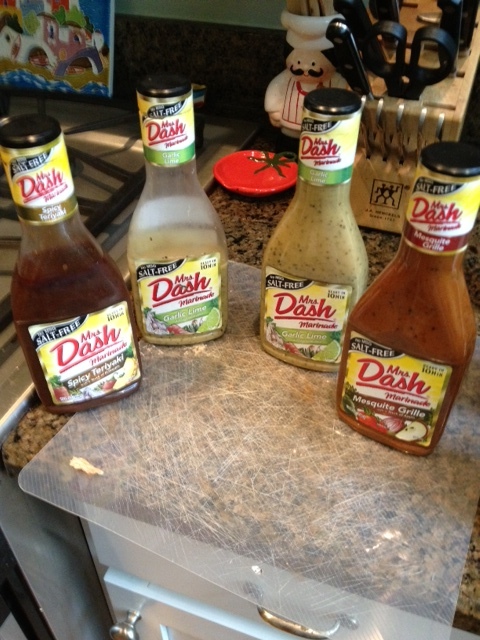 Mrs. Dash’s garlic lime works well with poultry and on vegetables, I’ve found. It has zero salt, 1.5 grams of fat and 4 grams of carbs per tablespoon. I recently order its mesquite grill marinade with 1.5 grams of fat and 3 grams of carbs, to try next. Mr. Spice makes a honey mustard marinade that has 5 mgs of sodium in two tablespoons and 35 grams of carbs, likely because the honey means sugar. It’s honey bbq sauce has 10 grams of carbs for two tablespoons and 5 mgs of salt so it would be a better choice if you’re watching your carbs as well. I found two tablespoons was enough to marinade some grilled veggies I recently wrote about. Neither of these is available in any food stores in my area, I bought the Mrs Dash on Amazon and went to Mr. Spice’s site to buy those. The cost can be high with shipping charges added in but I’m willing to pay to avoid constantly dry food. I wrote each company asking if they were in any food stores in my area. See their answers tomorrow. Salt free marinades — are they available in my area?